Hoping to equate the H-1B temporary foreign worker program with permanent immigration, advocates often lump the H-1B visa together with lawful permanent residence (also known as “green card” status). But the H-1B is a temporary, nonimmigrant visa for guestworkers, not a permanent immigration status that would eventually put a migrant worker on a path to American citizenship. The H-1B program can serve as a bridge to permanent immigration for many educated and skilled foreign workers; in fact, between 2010 and 2014, an average of 44,000 H-1B guestworkers became immigrants (i.e., lawful permanent residents) each year. The U.S. government approved an annual average of 115,000 new H-1B guestworkers over that same timeframe. The H-1B path to a green card is controlled by the employer. The employer—not the H-1B worker—has the discretion of applying for a green card, and as a result, employers hold a lot of power over the hundreds of thousands of H-1B workers here. The first step an employer must take to put an H-1B nonimmigrant worker on the path to a green card is to file for permanent labor certification with the U.S. Department of Labor (DOL), to check if there are any U.S. workers available to fill the job that the H-1B worker is already doing. (These are sometimes referred to as “PERM” applications or the PERM process, which stands for Program Electronic Review Management, the name of the electronic system used by the DOL.) Public data are available showing which companies applied for permanent labor certification for their H-1B workers and for how many, and these data let us examine whether employers typically use the H-1B program as a bridge to permanent immigration—or not. 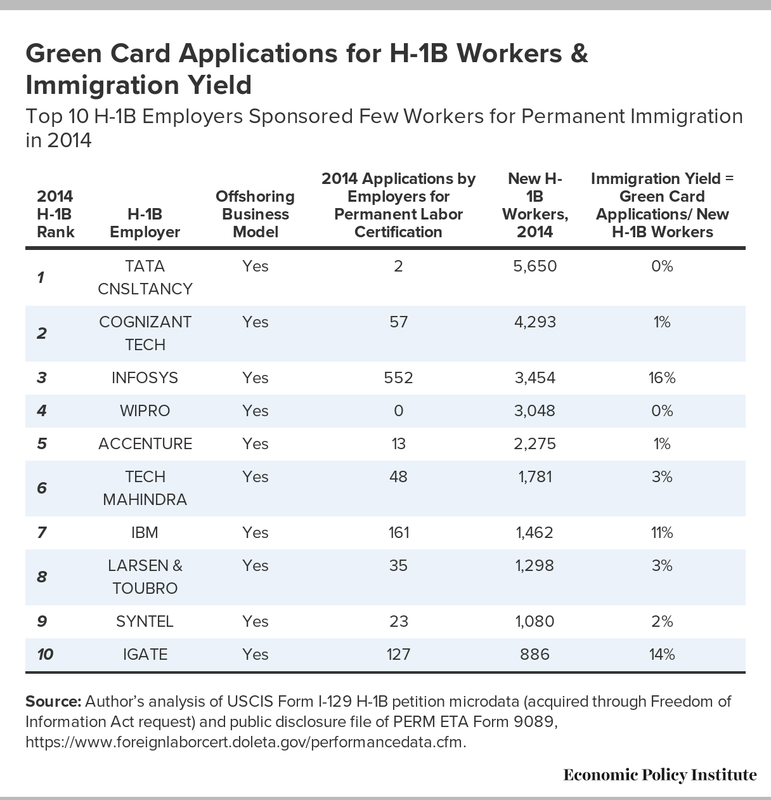 As the table below shows, the top employers received large numbers of new H-1B workers in fiscal 2014 but applied for very few green cards for their H-1B workers. Source: Author’s analysis of USCIS Form I-129 H-1B petition microdata (acquired through Freedom of Information Act request) and public disclosure file of PERM ETA Form 9089, https://www.foreignlaborcert.doleta.gov/performancedata.cfm. The 2014 data are consistent with many other years of H-1B and labor certification data that I have reviewed going back to at least 2008 (for example see here for 2008 and here for 2012). As a result, it is clear that for at least the past few years, the top H-1B employers have been using the program for temporary labor—and as a vehicle to outsource jobs to overseas locations—rather than as a bridge to permanent immigration, which could keep skilled workers in the U.S. labor market for the foreseeable future. A few examples illustrate the point. Cognizant, a U.S.-based offshore outsourcing behemoth, received 4,293 H-1B visas in 2014, yet applied for a mere 57 green cards for its H-1B workers in the same year. That is a 1.3 percent rate, or one green card application for every 75 H-1B workers. Ireland-based Accenture applies for even fewer green cards with a rate of 1 for every 175 H-1B workers. India-based offshore outsourcing giant Wipro received more than 3,000 H-1B workers and applied for exactly ZERO green cards for its H-1B workers in 2014. When it comes to the debate around the H-1B visa—one of America’s biggest guestworker programs—policymakers and the public need to keep in mind the important differences between guestworkers and immigrants, and how employers treat them.